The Cybermen were arguably the pinnacle of costume design development in the mid-1960s period of Doctor Who and remain as an iconic representation of how their design changed in a period where fashion, particularly French and British design, reflected the optimism of the space-age, embraced the use and combination of new materials and set the look for the future that would reverberate into the present day. 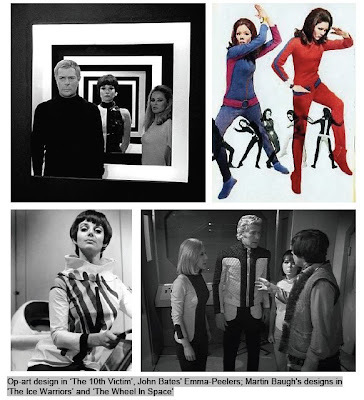 Doctor Who got into the groove and costume designers Daphne Dare, Martin Baugh, Barbara Lane, Sandra Reid, Bobi Bartlett and Nicholas Bullen all clearly grabbed the opportunity to bring signature 1960s futuristic designs to the series, reflecting the explosion of creativity that they found themselves in the middle of. The design team was clearly influenced, as were many others of the period, by British designers like Mary Quant and John Bates, and the French futurist triumvirate of Pierre Cardin, Paco Rabanne and Andre Courreges. 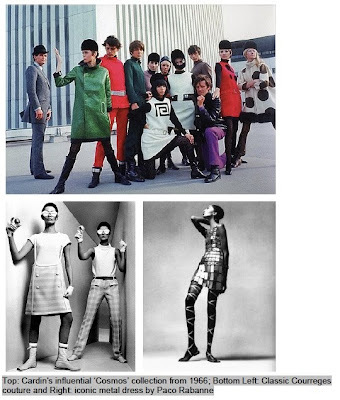 Cardin’s definitive "Cosmos" collection of 1966, featuring woollen mini-shift dresses with huge cut-outs or graphic target patterns of different colours, worn with domed felt helmets, had a major and lasting influence on how we thought we would dress in the future. "The clothes that I prefer are those I invent for a life that doesn't exist yet - the world of tomorrow," he was quoted. This influence seeped into a vast array of films and television shows in the mid 1960s and through to the mid-1970s. If Dior embodied the old guard, dressing the stoical aristocratic beauties clinging onto their pre-war way of life, then Cardin was the torchbearer of a world of social and sexual revolutions, industry mechanisation, and space travel. As the '60s dawned, Cardin's vision tuned into the Futuristic movement that was echoed in his purity of line, the geometric shapes and graphic silhouettes that he fabricated from body-conscious jersey, vinyl, Perspex, and a fabric called "Cardine" that he invented to mould into 3D patterns. “I was on the moon in this period," reflects Cardin, who also dressed the Beatles in their definitive collarless suits. The collarless Nehru jackets they wore for their famous Shea Stadium performance of 1965, a blend of minimalism and modernism, would influence countless television programmes and films; everyone from Blofeld in the James Bond films through to Ed Straker in Gerry Anderson’s UFO. The Nehru style can be predominantly seen in the costume designs for The Power Of The Daleks, The Enemy Of The World and for the War Lord and War Chief of The War Games. The ‘spy vibe’ would continue well into Doctor Who’s run in the 1970s, with the crowning glory of the Nehru suited Roger Delgado, oozing Bond villainy as The Master. Courrèges graduated in engineering before studying fashion and textile design. In 1961 he established his own fashion house and began to develop a different look. His Spring collection of 1964 showed radically different clothes. These designs included angular mini dresses and trouser suits using heavyweight fabrics like gabardine. Many of the outfits had cut-out midriffs and backs and were worn without a bra. These were matched with flat boots, goggles and helmets suggested by the equipment worn by astronauts. The stark shapes and white and silver colour scheme immediately earned the collection the name ‘Space Age’. Courrèges influence on Doctor Who could probably be traced back to the costumes for Maaga and her Draahvins in Galaxy Four that embrace the futuristic and military look. Many of the costumes we see in The Power Of the Daleks (the utility suits and goggles), The Macra Terror (an exaggerated militarism using PVC and goggles), and through to The Seeds Death (the Earth based security forces encompass Perspex helmets, PVC and vacuum cleaner attachments) are all influenced by Courrèges’ minimalist futurism. Paco Rabanne was a trained architect turned fashion designer. His architectural background led him to use disks cut from metal or plastic, linked with wire and other interesting techniques when he created his fashions. In his hi-tech 1960s period he produced metal, vinyl and plastic link dresses. These fashion experiments were important in pushing the boundaries of acceptable clothing to wear on the street. In 1966 Rabanne created his version of the moon-girl look in Perspex and metal and also plastic and acrylic. Rabanne is best remembered for his 1969 gold metal sculptured dress that inspired outfits for the film Barbarella. His influence, and that of Barbarella, can be seen in the costumes for The Space Pirates, for example, where the future gains a certain exoticism and a kitsch quality with oversized insignia and metallic trims on suits. But when did Doctor Who really go Mod? 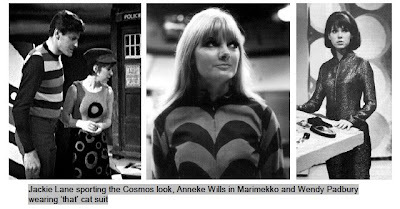 Although there were definitely some very Mod touches with Dodo Chaplet’s costumes in The Celestial Toymaker, featuring bold Cardin ‘Cosmos’ like symmetric shapes, things really began to stir with the arrival of Anneke Wills in 1966, who played Polly sporting some fantastic costumes by Finnish designers Marimekko. Her debut in The War Machines brought the series into an age where designers imagined a utopian future and the rapid pace of science altered the relationship between the body and technology and a series of visual proposals emerged that suggested not only how we would dress in the future but also how costume and set design would reflect the concerns of the age: pollution, security, nuclear conflict, fall-out, communication and surveillance. On Doctor Who, it is the work of costume designer Martin Baugh that should be singled out here. Baugh was responsible for some of the series’ major design statements in The Wheel In Space, The Ice Warriors and The Enemy of the World. In The Ice Warriors, his psychedelic costume designs for the scientists of Britannicus Base were based on the patterns of printed circuits. The idea came from his belief that in the future there might be machines that can automatically spray clothes onto a person. This immediately brings his costume designs into the realm of fashion futurologists such as Cardin, Rabanne and Courrèges, all trained either as engineers or architects, and their use of new materials like vinyl and PVC, geometrical forms and mathematical precision, and sculptural qualities and motifs such as circles, targets, lightning bolts. Like Cardin, Baugh designed costumes to suggest a uniform, where a small group formed some kind of futuristic army or technical crew. His later designs for The Enemy Of The World and The Wheel In Space take the popular jumpsuit look, immortalised in the 1960s by the John Bates designs for Diana Rigg in The Avengers, and using synthetics to produce a highly utilitarian look whilst also exaggerating the silhouette and providing much freedom of movement. This figure-hugging suit was also passed on to the character of Zoe Herriot, equally infamous for her tight fitting sparkly cat suit as worn in The Mind Robber. Baugh was also clearly capitalising on the ‘spy vibe’ of the late 1960s, films like Modesty Blaise, Barbarella and especially the exceptional work of costume designer Giulio Coltellacci in the Italian science fiction film The 10th Victim. Within the same period as Courreges' Moon Girl collection (1964), Coltellacci made great use of fun elements like geometric cut-outs, two-tone and striped motifs, and PVC boots and helmet/visors. Coltellacci’s influence can clearly be seen in Mary Peach’s wonderful leather outfits in The Enemy Of The World as well as the PVC black and white geometric one piece and helmet designs for the guards’ outfits. The black and white styling also informed the cat suits and padded jackets of the command crew in The Wheel In Space. Tanya Lernov, played by Clare Jenkins, was certainly a combination of Ursula Andress and Diana Rigg in her figure hugging design that was part space suit, part leisure wear. 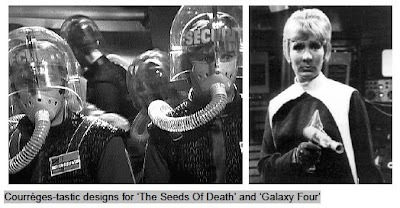 Other contributions from designers Nicholas Bullen on The Krotons and The War Games and by Sylvia James on The Seeds Of Death saw out the influence of futuristic fashions in the series. Increasingly, the space age dream was being replaced by references to hippie and protest culture. Bullen’s work on The War Games is outstanding as it embraces historical periods as well as the ultra-futuristic wear of the War Lords and the War Chief. It could be best summed up as a greatest hits of 1960s fashion. James’ designs for the operators of T- Mat radically avoids figure-hugging sexiness and the costumes are actually rather unflattering, particularly for the male characters, even though they do use modern materials like vinyl and PVC. The major drawback for the designers of Doctor Who in the late 1960s was that all of their work was being transmitted in black and white and there is a frustrating sense that the Troughton stories aren’t quite in the groove because they don’t embrace the explosion of colour that epitomised so much of 1960s design. Designing Who 2 (c) 2009 Frank Collins. If you wish to quote from this article please ask the author's permission. Hey, why don't you commission me to write some more! < Part 1: Cyber Suits You, Sir!